Students examine why the first ancient civilizations arose in river valleys. They locate these four ancient civilizations on a map and trace the rise of all four. Next, they compare and contrast the traits of the civilizations. Finally, they discuss what present-day civilization has gained from the ancient civilizations. In this experience, students examine why the first ancient civilizations arose in river valleys. They locate these four ancient civilizations on a map and trace the rise of all four. Next, they compare and contrast the traits of the civilizations. Finally, they discuss what present-day civilization has gained from the ancient civilizations. Students will work together in small groups in scene 3. This experience is an overview of ancient river valley civilizations, with a focus on the relationship between geography and their development. For specific exploration of each of these civilizations, see the units on Mesopotamia, ancient Egypt, ancient India, and ancient China. Explain the importance of river valleys in the ancient world. 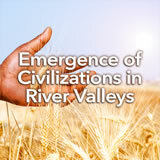 Analyze the relationship of geography to the development of ancient river valley civilizations. Where did the world’s earliest civilizations form? Why? What traits did they share? You’ll find the answers to these questions in this experience. Imagine that you are flying in a spaceship. Looking down, you see an Earth-like planet from another solar system. 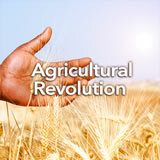 ​You search for a place to establish a human civilization. To choose the best location, what would you look for geographically? Discuss students’ responses. Ask additional questions so that students discuss some of the important geographical needs of a civilization. Highlight responses that focus on establishing a human civilization near water. The Complete List of Learning Experiences in Early Humans and the Agricultural Revolution Unit.